If you hate your misaligned or discolored teeth, you don’t have to live with it. Lumineers cover your teeth to give you the white, radiant smile you deserve. Lumineers, a specific brand of veneers, are thinner than other veneers and require minimal tooth preparation. If you need to make minor changes to your smile, Lumineers may be just the thing to give you a smile you’ll be proud of. Lumineers are substantially thinner than other veneers and don’t require the removal of as much tooth enamel, meaning that the process is reversible. Lumineers can also replace the need for traditional orthodontics in less severe cases. Your dentist at Chicago Veneers will closely examine your teeth and bite to determine whether or not Lumineers are the right choice for you. 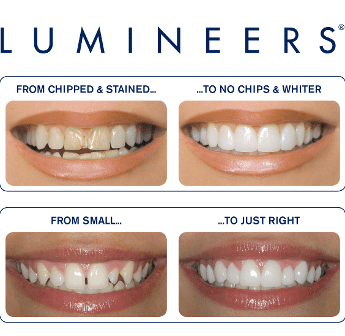 With only two appointments, you can have the smile you’ve always wanted thanks to Lumineers. During your first appointment, your dentist will whiten your teeth and create a mold of your teeth before sending it to the laboratory where your personalized Lumineers will be made. During your second visit, your dentist will painlessly apply your Lumineers to your teeth, giving you the straight, white smile you’ve always wanted. With proper care and long-term maintenance, Lumineers can last up to 20 years. You should visit your dentist at Chicago Veneers twice a year to ensure that they are secure and that your teeth and gums are healthy. As with our other veneers, you will receive a nightguard to protect your veneers, ensuring a lasting beautiful smile. Don’t wait to show the world your best smile! If you want to learn more about how Lumineers can give you the smile you’ve always wanted, call our office today at at (312) 435-0411 or request online for your appointment!